Amazon, Berkshire Hathaway, and JPMorgan Chase on Tuesday announced plans to partner-up on ways to cut health-care costs and improve services for U.S. employees. The new company will be independent and “free from profit-making incentives and constraints.” The businesses said the new venture’s initial focus would be on technology solutions. Companies get a tax break for offering health benefits to their workers, and many employers also see them as a critical tool for attracting and keeping workers. But costs are soaring and health care consumes a growing chunk of their budgets. Small businesses have been under particular strain. News of the deal slammed suppliers in the industry including CVS, United Health and Aetna. 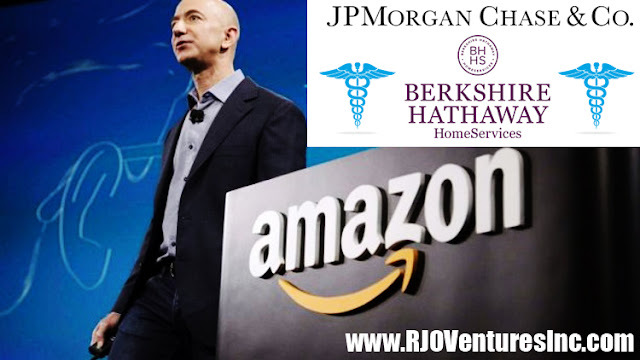 Amazon, JPMorgan & Berkshire Creating a New Health Care Company. Featured at RJO Ventures, Inc.